La Tipica, an all-girl orchestra from Baytown’s Mexican community. La Tipica -- an all-girl orchestra composed of talented and well-trained students from Baytown’s Mexican community -- played an important role in local musical entertainment from here to California. In 1946 the young musicians, directed by Tipica founder Dr. Antonio Banuelos, went on a concert tour from Texas to New Mexico, Arizona and California. Generally regarded as a musical genius, Banuelos – known as “The Professor” -- was a native of Spain, graduate of German conservatory and a member of the Houston Symphony. He also was the man who put Baytown on the map of Latin American music. In addition to Tipica, Banuelos directed the Mexican Boys Band, another product of the music program that began in the Goose Creek school system in the middle of the Depression. Elvira Renteria Martinez, who played the marimba in Tipica, recalled that Banuelos wrote all of the musical scores by hand. La Tipica Orchestra played for countless community-wide and school programs far and near and were much in demand for special occasions such as Cinco de Mayo and Mexican Independence Day Sept. 16. This photo was taken on the stage of a school auditorium in the 1940s. On the front row, from left, are Eva Rentería Barajas, Margaret Martinez DeLeon, Aurora Hinojosa Rentería and Alice Salinas DeHoyos. Second row, from left: Socorro Juarez Barajas, Pura García Muñoz, Mary Ellen Rincon Muñoz, Soledad Marron, Alice Lopez Araujo and Rachel Torres Lara. Third row, from left: Carrie Salazar Martinez, Lucy Alvarado Zamora, Amada Vazquez Quijano, Amalia Vazquez, Carmen Piña Contreras, Gloria García Hinojosa, Elvera Rentería Martinez, director Dr. Antonio Bañuelos, Antonia Lopez Loredo, Flora Martinez Ramirez and Janie Salinas Bricker. Meanwhile, the Gulf Coast was destined to lose Bañuelos to the West Coast. He received an offer he could not turn down and, after the tour, returned to California. Some of the Tipica members kept in contact with him until his death during the Sixties. Tipica members treasure the serenade because it traditionally was played for their mothers before every Mother’s Day. “There was always a community dance on the Saturday night before Mother’s Day. We would go to the dance and from there, proceed to De Zavala, tune our instruments and board a truck that had a huge bed … We would then go to the home of each of the orchestra members and sing and play ‘Las Mañanitas’ for each mother. “We did this for many years and it never ceased to be a very touching time.” In addition to ‘Las Mañanitas’ each girl would select a song that she knew her mother liked, and they would play that song before proceeding to the next home. At the last home on their schedule, the girls always were served Mexican hot chocolate and pastries. Initially Humble Oil & Refining Co. paid Banuelos’ salary, and the parents also paid a portion. The school district eventually began paying his salary in full. During World War II, Tipica members did their part for the war effort, playing for war bond rallies. The girls would leave school early – from elementary, junior high or high school – and tune their instruments and change into their costumes at De Zavala. From there they’d go to the refinery gate and play a concert as refinery employees were changing shifts. The workers would stop and listen and then buy war bonds on the spot. The bond drives proved to be a big success and the Tipica musicians continued the concerts as long as the bond drives went on. They also played at veterans’ hospitals in Temple and Houston and at a military camp. A feast for the eyes, their colorful costumes were purchased in Mexico. 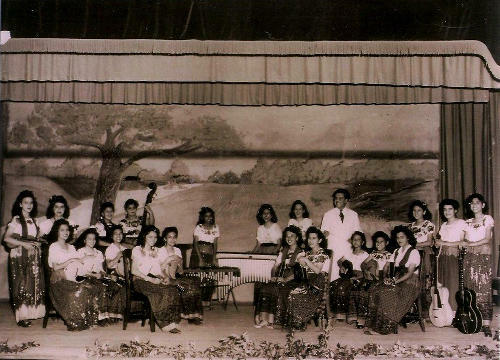 La Tipica Day was proclaimed by then-Mayor Pete Alfaro in 2002 in honor of the 65th anniversary of the orchestra. On the front row, from left, are Socorro Juarez Barajas, Aurora Hinojosa Rentería, Alice Lopez Araujo and Margaret Martinez DeLeon. 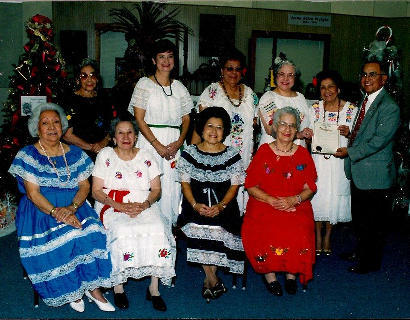 Second row, from left: Lucy Hinojosa De Palma, Rose Marie Avelar, Gracieka Pantoja Capetillo, Elvera Rentería Martinez, Gloria García Hinojosa and Mayor Alfaro. Today, the remaining members of Tipica continue to have a strong bond, still getting together to play their music and have fun. Since the marimba is hard to carry, they meet in Martinez’s home. “The last time we played was a few months ago for a visitation when our original pianist died,” she said. The orchestra had no official theme song but chose “La Jesusita en Chihuahua” to open a concert at the Baytown Historical Museum for the unveiling of the Hispanic Heritage Exhibit. Jesusita is translated to mean Jesse or Jessie, and the orchestra played the song to honor their beloved De Zavala principal, Jessie Lee Pumphrey. Remembering The Professor, the members closed the concert with a march called “Zacatecas.” When Banuelos family members left Spain, they came to Zacatecas, Mexico. A funny thing happened on their way to California in ’46. When the Tipica members arrived at the first city on the tour, they learned they were being billed as being from Mexico and therefore did not speak English. “We could not believe it,” Martinez said. “We were to speak only Spanish while we were in public. The problem was that our PTA and our teachers had agreed that no Spanish was to be spoken on campus in order that all may master the English language. Consequently, English had become our primary language over the years. Both La Tipica and the Mexican Boys Band had their inception in about 1935 when Humble Oil & Refining Co. hired Banuelos to teach music to the children of Humble employees. Some of the instruments came from the company band that had disbanded. The music students met at the community hall owned by the company – the same location where they attended school before the original De Zavala was built. After the school building opened, children of non-refinery workers entered the music program.